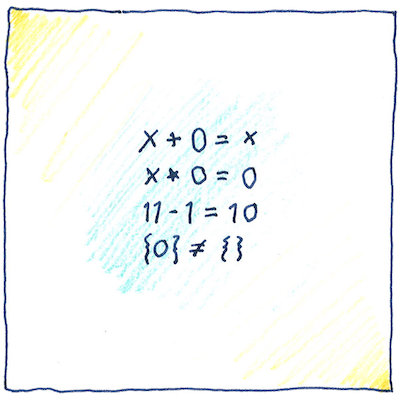 is the first known text to describe how to use zero as a number. and whether the result is positive or negative. and for the value of π.
as a placeholder for zero. in their knotted cord device. in other numbers, to distinguish, for example, 105 from 15.
in the numeral system for their long-count calendar. but they did not perform arithmetic with it. “ś ūnya” to refer to zero or void. today we say it is neither positive nor negative. today we say division by zero is undefined. the same as the empty set. is a key to spiritual enlightenment. whose energy is all in its frequency. it’s better than not replying. nothing being the same in all circumstances. is the same as no banana. how close we are to nothing at all. We make a distinction between 0, the number of nothing, and 0, a digit that is used in numbers written with digits in our positional number system. History shows that the digit 0 came first (using various symbols). The history of the number 0 came from Brahmagupta. The Islamic world already had the positional number system. Brahmagupta gave them the number 0. The Persian, Muḥammad ibn Mūsā al-Khwārizmī (the inventor of algebra), oversaw translation of Brahmagupta into Arabic. Al-Khwārizmī’s work in Latin translation in the twelfth century introduced the Hindu-Arabic numeral system to the Western world. Fibonacci, having learned from Arabic mathematicians, contributed to its adoption in the thirteenth century.